This disc is a veritable master-class on how to perform Dvorák’s symphonic poems. Charles Mackerras gets so many details right, and reveals so many others, that few listeners could listen to this album without gaining a greater appreciation of the music. The Czech Philharmonic Orchestra has recorded the symphonic poems many times before (under Zdenek Chalabala, Václav Talich, Václav Neumann, Jirí Belohlávek and, I’m sure, others), but most of those sessions were long ago and the orchestra gives no sign of having lost any of its love for Dvorák. This is Dvorák’s most programmatic and most graphic music, based as it is on a cycle of brutal folk ballads by Karel Erben. The stories are darkly entertaining on their own: The Noon Witch, for instance, tells of a village where parents keep their children in line by warning that the Noon Witch will come and get them when they misbehave. The well-meaning elders are then distraught to find (in the fifth minute of the music) that there in fact is a Noon Witch, and she really is eating their children. As bloody as the storylines are, the music is best described as festivals of forward-thinking orchestration, with eerie effects, dark solos for instruments like the bass clarinet, more percussion than is usual for Dvorák, and wide, even wayward rondo structures. The four tone poems, written near the end of the composer’s life, had a significant impact on the music of Leoš Janácek, who conducted the premiere of The Wild Dove in 1898, as well as on the style of the man who led The Wild Dove’s first Viennese performance: Gustav Mahler. It is fun to trace influences and listen for innovations in performances as sensitively conducted, and expertly played, as these. This is especially true because Supraphon’s booklet notes are terrific, combining summaries of each poem’s storyline with analyses of the tone poems’ place in Dvorák’s output and their influence on subsequent composers. As for the playing: The opening of Water Goblin is perfectly judged, the balance of the woodwinds against each other just right as the flutes unveil the main theme. What I love here is how well the Czech Philharmonic can play quiet music: the first minute or so, as the music “fades in” to the first climax, feels exactly right. Mackerras really knows, dare I say like nobody else in this music, how to balance the different orchestral sections; for confirmation, just listen to the subtle but still frightening strokes of the gong and chimes near the end of this piece, over tapping timpani which soon explode into what could be described, tongue in cheek, as fate knocking at the door. Further proof is in the balance of violin and English horn solos in various episodes of The Golden Spinning Wheel. The Czech winds bloom at the onset of Noon Witch, a beam of light after the Water Goblin’s shadowy close. But it is not to last: after the hustle and bustle of the five minutes, which together are just about the happiest music on the whole disc, the low brass cut in with the entrance of the witch. It’s not as effective a show-stopper as on Rafael Kubelík’s recording with the Bavarian Radio Symphony Orchestra, and indeed I don’t think the subsequent bass clarinet solo is as moody, either, although the trumpets play much more cleanly and the violins really do sing their hearts out around the seven-minute mark. The Noon Witch is a classic illustration of Dvorák’s genius for surprising endings, and Mackerras gets the wild last few seconds perfectly. The opening seconds of Golden Spinning Wheel, with the motoric cellos coupled to gentle cymbal crashes, are almost impossible to resist. This is the longest symphonic poem and the only one with a happy ending; Mackerras turns in the best performance I’ve ever heard. Here are sharp, precise rhythms, resplendent strings in the love music and an operatic pace which generates increasing excitement and drama as the piece proceeds, even in the central episode which sounds like a new Slavonic Dance. Compare this to the relatively tame, unexcitable Simon Rattle account on EMI, and the extra thrill of the Mackerras reading is even more obvious. The Wild Dove, my favorite of the four, draws another terrific performance, with truly huge excitement in the celebratory wedding march, an impassioned love scene, and then a transition into the brutal depths of the story’s close (12:45-13:00) which Mackerras and orchestra handle perfectly. They then make the case more strongly than anyone else that the music which follows is not just elegiac, not just tragic, but thrilling too, even terrifying. And here one can sense genuine sympathy for the plight of the poem’s antihero as she prepares to end her life. The violin solo is more strait-laced than on, say, Kubelík, but overall the Czech Philharmonic is more characterful and indeed more accurate at even faster tempi than the Bavarian Radio orchestra, or the Berlin Philharmonic under Rattle. Throughout the CD the clear recordings allow all manner of orchestral details to shine through, like the tuba part at 11:30 in Water Goblin or the growling basses at 16:28 in Golden Spinning Wheel, and the sound also flatters the huge number of solos Dvorák writes for nearly everyone in the orchestra. One might wish for more prominence for the percussion, but it is not a serious complaint, and indeed it could be argued either way. I approached this disc with high expectations. 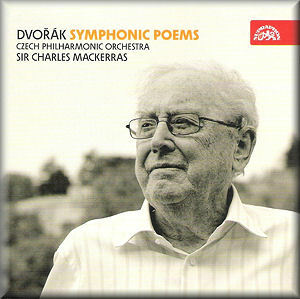 Charles Mackerras is one of the great interpreters of Czech music, perhaps the most important ever to hail from outside the Czech Republic. As he has in numerous recordings of Dvorák, Janácek, Smetana and Josef Suk before, he amply proves why here. In fact, my expectations have actually been surpassed. This album easily dispenses with Kubelík to become my reference edition for the symphonic poems. The Golden Spinning Wheel was previously released coupled to Dvorák’s Symphony No 6 (a disc I am also very happy to own), but the other three works are in brand-new recordings by an 85-year-old conductor who shows no sign of ceasing to be one of the greatest classical artists of our era.